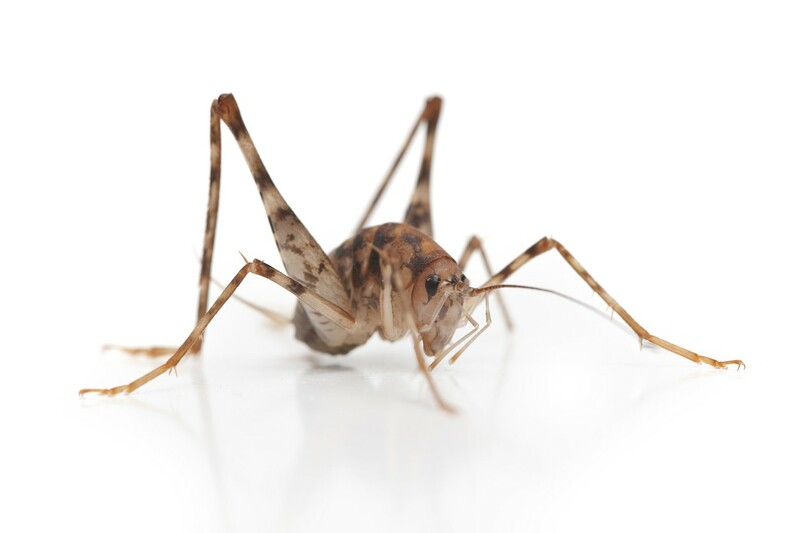 Spider Crickets can become a pest in and around the home. Most pests want to live where people live, but spider crickets are different. They love dark, damp, cave-like settings where they can nest. These environments provide both water and food. Spider crickets can live in a home for long periods of time without residents knowing. As their population increases, some will get into living areas. Before we discuss methods of spider cricket control, it is important that you understand some basic biology of this pest. 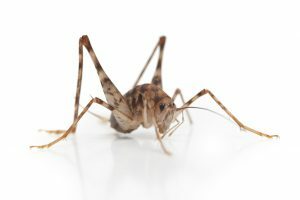 Spider crickets appear throughout most of the United States. They will move into areas around the home taking up residence under porches and sheds. They love moisture and darkness. Such areas produce fungus and mold – both of which can feed this species of cricket. In addition to mold and fungus, spider crickets will feed on fabric. This becomes a problem in the home since migrating crickets can cause substantial damage if left unchecked. Once spider crickets are established around the home, they will readily move inside for shelter from the hot summer heat. Crawl spaces and basements provide excellent nest sights. If you are finding some in your basement, it means you have a problem that needs to be treated. Controlling spider crickets is easier before they get established. If you have a home with a crawl space, it is important that you check periodically. Such inspections may reveal pest problems. If you find crickets during any inspection, try to treat it as soon as possible. Since spider crickets reproduce quickly, it is wise to get rid of them before populations swell. If the population is large, expect to have them migrating out of the crawl space and into living areas of the home daily. This is disconcerting to residents since this cricket is unusual to look at. It is almost hairy looking with all it’s antennae. Since it grows large, many people are surprised at just how big they are. Another unique feature of this cricket is that they jump randomly and are more likely to jump at you than away from you. It is believed this is due to how they see. Their vision is such that it appears to them they are moving away from it’s predator but in fact they are moving towards it. Some people speculate this has lead the species to appear to be attacking which in turn chases away would-be predators. Whatever the reason, keep in mind they cannot bite or sting. Even still, having a large unusual insect jumping at you will probably feel disconcerting. Another problem with letting spider cricket populations going unchecked is that they can cause a lot of damage to fabric. They love to eat both synthetic and man made material including rugs, furniture, books, canvas, clothing, boxes, linen, drapery, and just about anything we have in our living area. This can lead to damage which looks like some type of moth. Because this cricket is rather large and meaty, mice and rats are fond of them. Many times rats and mice will take advantage of populations which are active in your home. This could lead to rat and mouse infestations as well and will require more even pest control! Because of the problems associated with letting cave crickets live in your home, it is wise to take action to stop such infestations. There are several treatments available to control spider crickets. In general, liquid spraying the outside foundation will keep them from entering the home. But once inside, you’ll need to discover where they’re nesting. In most homes this will be a crawl space if the home has one. If there is no crawl space, the next likely nest site will be a wall void – especially if you have a finished basement. 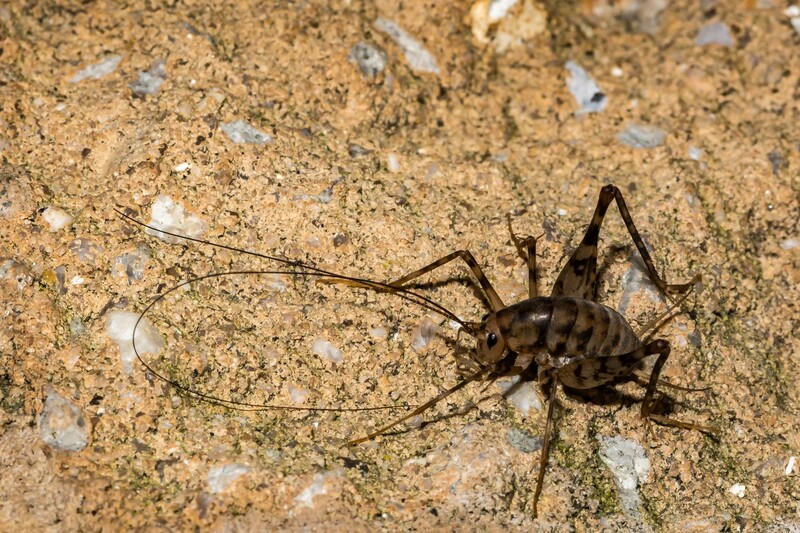 Spider crickets love nesting behind the walls of finished basements. Spider cricket control needs to start on the outside of the home. 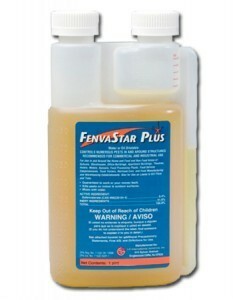 Treat this area with FENVASTAR. This is a low odor concentrate which mixes with water. Simply spray foundation walls, around windows and doorways, under decks and sheds. Also focus on any port of entry like AC units, electric cables, etc. Fenvastar will kill spider crickets living on your homes siding as well as keep them away. Add .4 to .8 oz per gallon of water and expect to spray 1-2 gallons around your home. Treatments will last 30-45 days so try to treat every month when crickets are active. Use a standard PUMP SPRAYER to treat and around the home, create a good 5 foot band of treated area. Any structure close to the home which may be harboring crickets should be treated thoroughly. If you have them active inside living areas, you can spray baseboards with Fenvastar too. But in general, this will only kill the ones entering and you’ll still keep seeing them. Alternatively you can apply small amounts of NIBAN FG bait. This light “wheat germ” like granule is easy to apply and can be used safely in living areas. Sprinkle small amounts out under furniture where spider crickets have been seen. They’ll find it when foraging for food, eat it and then crawl off to die somewhere hidden. Niban uses boric acid as an active so its very safe for use in living area where children and pets are active. But its deadly on insects like ants and crickets. 1 lb is enough to cover up to 500 sq/ft. If you have lots of cracks and crevices, spaces or voids where spider crickets might be hiding, use a BAIT APPLICATOR to get the Niban where it will have the best impact. This device will allow the user to “blow” the bait into voids when the bulb body is squeezed. Lastly, set out CRICKET TRAPS to help corral and catch foraging spider crickets. These traps use special pheromones crickets love and will find the traps placed under furniture, along baseboards and other discreet locations. Although spraying the outside perimeter of the home and baiting inside for spider crickets will help the problem, they will keep coming if you have an infested crawl space. For homeowners with infested crawl spaces and/or basements, focusing your effort here will often solve the problem. This is particularly true when infestations have found their way behind finished walls of basements. So if you suspect you have an infested crawl space or if you think spider crickets are living behind the walls of your finished basement, treat them with DELTAMETHRIN DUST. This low odor dust is similar to baby powder. When applied to a crawl space, it will coat the walls and ceiling killing all the nesting crickets and their hatching young. One pound of Deltamethrin Dust will cover up to 500-1000 sq/ft. Remember, that if your crawl space is 20 feet wide by 20 feet long and is 3 feet high, you actually have about 1000 sq/ft to treat. To arrive at this number, just add the square footage up for the ground and ceiling of the space which is 400 plus 400. And don’t forget the walls. Each wall is another 60 feet so the total square footage is actually 1040. Treatments with this dust will last 6-12 months and in most cases, solve the problem for good. Just renew the dust every 1-2 years to ensure they don’t come back. To get good coverage in the crawl space, apply it with the DUSTIN MIZER. 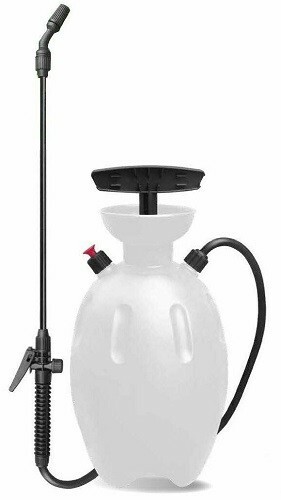 This device has a small holding tank for the dust and then using the hand crank to “blow” the dust out, you can send it 20-30 feet outward and over the space. Such treatment is critical for long term control. In most cases, if these areas are treated right in the first place, the spider crickets will never come back. I live in a mobile home and I have had a few in my house big and scary..I was wondering if there are bug bombs that you can toss under the trailer as well as spraying around the whole house? Total release aerosols (aka: bug bombs) are not an effective tool for most pests. In this case, they definitely won’t help. The big problem is that insects can detect the aerosol as it releases and once they know its coming, they’ll retreat to hidden, protected areas where the aerosol won’t get them. Second, since the space under the home is porous, the aerosol will permeate into the ground leaving no active residual. This will allow more to repopulate within days. To properly treat this space, you’re best option is to first dust with the Deltamethrin dust listed above. Using a Dustin Mizer also shown above, you’ll be able to cover the entire space effectively. One treatment will last 6-12 months which is the longest control you can get these days. Next, set out the Niban and traps in the living area and then spray around the mobile homes “skirt” with the concentrate above. This will keep any new ones as well as other perimeter pests from entering the space but even if some did, the dust would get them or the bait/traps should they find their way into the living space. Yes and no. How can that be? Let me explain.. When we think of pests like fleas and mosquitoes, we think of “true” biting pests as they relate to people. When they land on us, they do so with intent: they want to feed on our blood! Spider crickets don’t do this. They are voracious eaters and have strong chewing mouth parts. And they will consume most anything. But they don’t target people. That being said, if one jumps on your skin, it could “bite” as a reaction or natural defense to the situation because they are equipped to do so. 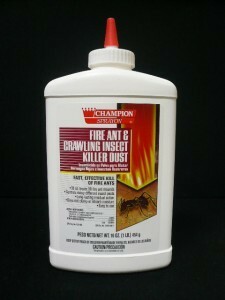 We’ve used Niban for several years against spider crickets. It seems to lose it’s effectiveness after a while, though there are plenty of granules still around. Does it lose its effectiveness after being exposed to the air? Niban can help when foraging crickets feed on it. But its not magic nor will every cricket find it regardless of its age. So to answer your question; it generally won’t loose its effectiveness when used in the home where it’s relatively dry and protected from the environment. In fact the active will remain fine. The “taste” might not be the same but remember, we’re talking about crickets. These guys routinely feed on each other and dead insects any chance they can so does the taste of the Niban matter? Probably not. And the active can’t degrade so it should be as effective two years after its set out unless its getting contaminated by some kind of chemical, cleaner, dirt, rain, etc. Also remember that crickets which die and remain hidden can become food for more crickets so there is always the chance that what you’re seeing are new crickets coming around to feed on old dead crickets. And why would they choose to eat Niban when they can instead eat some dead crickets? Something else to consider is to install some of our cricket traps. They can help monitor your problem. Again, they’re not a solve all but they can alert you to problematic sections of the home which you can then address more appropriately in case you’ve missed them. Also, if you haven’t yet dusted wall voids or crawl spaces where they might be coming from, do so ASAP. These areas are almost always the source and failure to get them properly treated will mean there will be a never ending stream of them coming into living spaces. And no matter how much Niban you set out or glueboards you deploy, they’ll just keep coming. I’ve already ordered your cricket traps.